Bioluminescent Fungus Kit is rated 3.5 out of 5 by 4. Dubbed "foxfire" by hunters in the Appalachian Mountains, the fungus Armillariella mellea emits a low-level bioluminescence. For a class of 30. Dubbed "foxfire" by hunters in the Appalachian Mountains, the fungus Armillariella mellea emits a low-level bioluminescence. 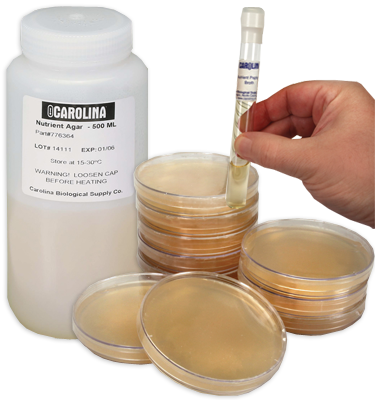 The phenomenon can be observed 1 to 2 weeks after subculturing and lasts about 8 weeks. Room must be completely dark to observe the bioluminescence. Rated 4 out of 5 by franco999 from The fungus luminesced at 2 weeks. I followed the simple instructions which advise to avoid contamination. I wiped clean with store-bought Lysol various surfaces around the preparation area and used cheap plastic throw-away gloves on my hands. Using the supplied sterilized scalpel I transferred cut samples from the source dish to five of the supplied agar dishes, taped the lids on, and stored the dishes upside-down in a dark closet. At exactly two weeks I took the five dishes to a dark closet with very little light leakage, waited about 3 to 5 minutes.for my eyes to dark adapt, and saw 3 out of the five samples clearly glowing faintly. A fourth sample was beginning to glow but was very hard to detect. The fifth sample did not appear to emit anything. Of the three distinct samples, they did not glow equally. One was good, the second was weaker, and the third was weaker yet. In a few days I will examine the samples again. So, my take-aways are there was substantial variability among samples, and very weak light emission requiring viewing in a quite dark environment and waiting for eye dark adaption in order to see the luminescence. One of my goals was to measure the luminescence with a avalanche photodiode detector that I constructed, but it did not detect this very low level of light emission. I am still working on that aspect. Rated 5 out of 5 by ALed from This product was interesting and easy to use. I used this with my middle school biology class and they had fun cutting the pieces off, transferring it to the new agar and watching it glow and become bioluminescent. Rated 1 out of 5 by gofigure07 from Didn't work; not worth the price I was very excited to use this product. It would have been great for when we covered the fungi kingdom and discussed adaptations. This product however did NOT meet my expectations. We carefully followed directions in class however none of the petri dishes cultivated the fungus. All we grew was mold. It was definitely a total waste of money. I would not buy this product again or recommend this at all.